Michael Luhr. 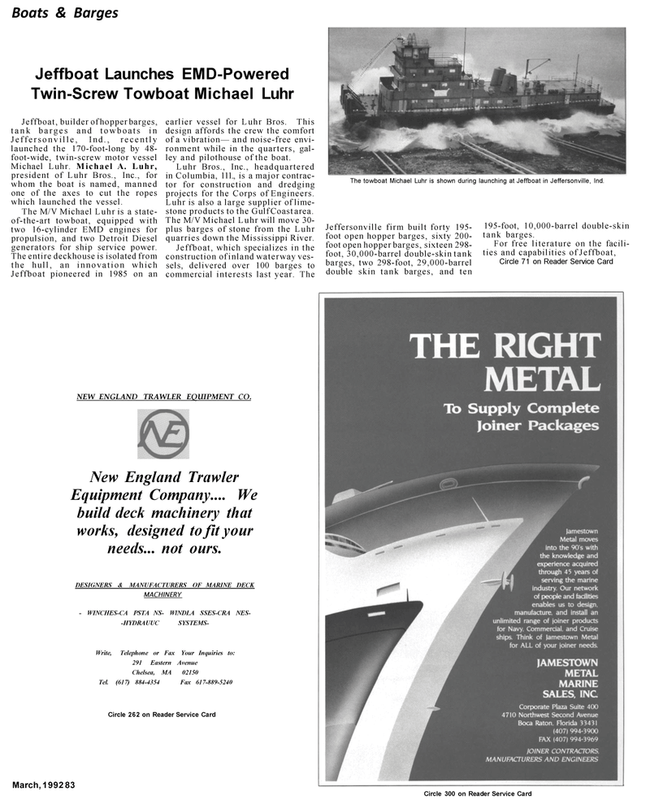 Michael A. Luhr, president of Luhr Bros., Inc., for whom the boat is named, manned one of the axes to cut the ropes which launched the vessel. The M/V Michael Luhr is a state- of-the-art towboat, equipped with two 16-cylinder EMD engines for propulsion, and two Detroit Diesel generators for ship service power. Jeffboat pioneered in 1985 on an earlier vessel for Luhr Bros. This design affords the crew the comfort of a vibration— and noise-free envi- ronment while in the quarters, gal- ley and pilothouse of the boat. Luhr Bros., Inc., headquartered in Columbia, 111., is a major contrac- tor for construction and dredging projects for the Corps of Engineers. Luhr is also a large supplier of lime- stone products to the Gulf Coast area. The M/V Michael Luhr will move 30- plus barges of stone from the Luhr quarries down the Mississippi River. The towboat Michael Luhr is shown during launching at Jeffboat in Jeffersonville, Ind. Jeffersonville firm built forty 195- foot open hopper barges, sixty 200- foot open hopper barges, sixteen 298- foot, 30,000-barrel double-skin tank barges, two 298-foot, 29,000-barrel double skin tank barges, and ten 195-foot, 10,000-barrel double-skin tank barges. NEW ENGLAND TRAWLER EQUIPMENT CO.
Equipment Company.... We build deck machinery that works, designed to fit your needs... not ours.